I'm back with yet another review of a sunscreen. This time around I want to feature a brand that almost all of us Malaysians know when it comes to sun protection. Many months ago Sunplay made an event where you can request a sample from them so I took the chance and received it without any hassle. The sample came in a 10g travel size. I gave this ago for a 2-month duration period ( I didn't use it every day). Did it live up to my expectation and more importantly, did it deliver the results it promised? We shall see! Click more after the jump. As a sunscreen enthusiast, Sunplay is not something new for me. In the past, I've tried their Super Block Sunblock Lotion, the famous one that comes in a tiny red bottle with high SPF level and also Sunplay SPF130 PA+++ Super Block Clear Finish Lotion. I personally feel that this brand is famous for having sunscreens with high SPF level. Now, it's time to look back what is the meaning behind SPF. and the number associated with the SPF is the number of times longer you will be protected from sun burning than you would be without sunscreen. 3 main points highlighted by Sunplay. (1) Photostable- with 6 UV filters to provide stable broad spectrum UVA/UVB protection that does not break down easily under the sun. (2) Prevent Premature Ageing- with potential anti-aging ingredients to help to maintain a youthful appearance. (3) Intense Hydration- with Hyaluronic Acid for long lasting hydration. Sunplay or Metholatum (the parent company) has a pattern sunscreen formulation called as "Solarex-3 technology" where you can find it not only in this UV Watery Essence but also other sunscreens under the Sunplay Skin Aqua Range. Read more about Solarex-3 on their official website. Link [here]. Apply evenly on face and body. For desired results, re-apply after perspiring, towel, drying or vigorous outdoor activity. It's exactly the one that they used for their sampling, except in bigger size. 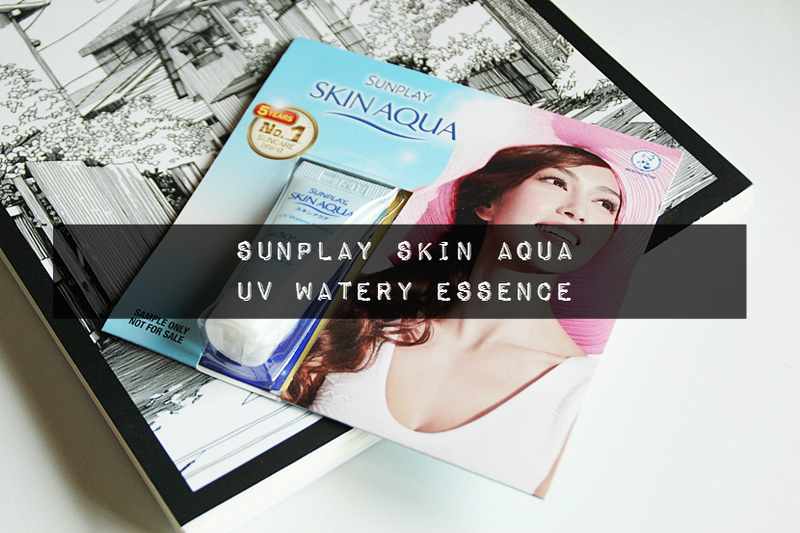 In Malaysia, a bottle of Sunplay Skin Aqua UV Watery Essence retails for RM40.00 and it contains about 50ml of sunscreen. The dispensing system is pretty simple, it's just a small hole from the tube and it also has a twisted cap. Plastic material- I'd give this an A+, very good. This is a lot better that the previous sunscreen I've reviewed recently. Although the bottle is in light blue colour, I cannot see the sunscreen level if I put the bottle against a strong light source (eg: natural sunlight coming from the window). I appreciate Sunplay's effort of using thick and opaque plastic material so that any sunlight wouldn't pass through the bottle easily, hence resulting in more stable sunscreen formulation. One thing about this sunscreen is that it has an extremely long ingredients list. So for the longest time, I always feel intimidated by the daunting task of writing a review for it 😱. ...that time where I wished I had a bigger packaging. Water, alcohol, Ethylhexyl Methoxycinnamate, Phenylbenzimidazole Sulfonic Acid, Biosaccharide Gum-1, C14-22 Alcohol/C12-20 Alkyl Glucoside, Propylene Glycol Dicaprylate/Dicaprate, Cyclopentasiloxane, Disodium Phenyl Dibenzimidazole Tetrasulfonate, Diethylamino Hydroxybenzoyl Hexyl Benzoate, Bis-Erhyhexyloxyphenol Methoxyphenyl Triazine, Silica, Butylene Glycol, Ethylhexyl Triazone, Polysorbate 60, Sodium Hydroxide, Sodium Citrate, Methylisothiazolinone, Methylparaben, Propylparaben, Phenoxyethanol, Behenyl Alcohol, Tremella Fuciformis Polysaccharide, Xanthan Gum, Fragrance, Disodium EDTA, Citrus Aurantium Bergamia (Bergamot) Fruit Oil, Helianthus Annuus (Sunflower) Seed Oil, Rosmarinus Officinalis (Rosemary) Leaf Extract, Sodium Ascorbyl Phosphate, Sodium Hyaluronate, Caprylic/Capric Triglyceride, Laminaria Ochroleuca Extract, Citric Acid, Ectoin. 1. As always, water is needed as a solvent to keep other ingredients flowing. Then we have alcohol, which is also a solvent. I don't know what kind of alcohol is used in the formulation, but most probably it is 'denatured alcohol' or also known as 'alcohol denat.'. This controversial ingredient doesn't have a good reputation in skincare world because it is said to be drying (which is true, trust me, I worked with alcohol denat in the lab for years) but honestly, it doesn't really matter because at the end of the day, what we are looking for is the end product. Whether it's drying or not, it depends on what else is in the formula. Some cosmetic chemists claimed that it is okay to have alcohols in skincare but you know, the choice is still yours. A little note here is that when alcohol is used as a solvent, it means that it help other ingredients to cooperate, usually the ones that aren't soluble in water. If you look further down the ingredient, Ethylhexyl Methoxycinnamate, for example, is not soluble in water but will do so in oil and alcohol. Ethylhexyl Methoxycinnamate (other names: Octinoxane or OMC) is commonly used as a UVB filter and that organic compound alone is not the most photostable UV filter around because it degrades rapidly when exposed to sunlight. Therefore to make the formulation photostable, they need to include several other types of UV filters. Phenylbenzimidasole Sulfonic Acid (other names: PBSA or Ensulizone ) is another UVB filter. Unlike Octinoxate that appears to be colourless or slightly yellow liquid at room temperature, PBSA has a white crystalline powder appearance and it's always preferred in the formulation of a water-based and gel sunscreen because it can results in less greasy finish [source]. Upon my reading, this UV filter is rather, controversial. In a 2010 research, it's found that PBSA generates free radicals when exposed to UVA and UVB radiation, leading to DNA damages. You can read more in this journal: The Sunscreen Agent 2-Phenylbenzimidazole-5-Sulfonic Acid Photosensitized the Formation of Oxidised Guanines In Cellulo after UV-A or UV-B Exposure. Just keep in mind that the experiment was done in the lab, in vitro, not on an actual person, so it might not accurately represent human skin-sunscreen filter situation. Next, we have Disodium Phenyl Dibenzimidazole Tetrasulfonate that provides mainly UVA protection. This ingredient is yet to be approved by the FDA, so you might not be able to get this sunscreen in the US. Another active sun filter in this sunscreen is Diethylamino Hydroxybenzoyl Hexyl Benzoate. Well, I don't blame you if you've never heard of it because I don't too but maybe you are familiar of Uvinul A Plus? Because they are both the same thing. Uvinul A Plus absorbs UVA radiation and it's one of the most stable UV filters. Unlike PBSA that gives out free radicals when in contact with UV, this ingredient will do otherwise- it gives strong protection against them. Uvinul A Plus is yet to be approved by FDA. Bis-Erhyhexyloxyphenol Methoxyphenyl Triazine or the shortened and more recognisable name for it, is Tinosorb S, provides protection against both UVA and UVB rays. It's very photostable just like Univul A Plus. Last but not least, Ethylhexyl Triazone or also known as Uvinul T 150. It gives the skin protection from UVB radiation. The maximum concentration for this UV filter is 5% (this sunscreen is manufactured in PRC so they are following the European standard regulation) making anything below it are less likely to exceed 5%. 3. Other ingredients inside this formula are mostly made up of emollients such as Biosaccharide Gum-1 and Propylene Glycol which they both give the moisturising feeling to the skin. 4. Preservatives used in this sunscreen include Methylisothiazolinone, Methylparaben, Propylparaben, and phenoxyethanol. Should you be scared of using products containing parabens? Umm, no, unless you're sensitive to them. 5. Down after preservatives are plant oils and extractions, and guess what? hyaluronic acid! Orang cakap buat syarat je... I don't know why the company would advertise things like hyaluronic acid when I doubt it would do anything near "intense hydration" if it is used in a tiny quantity. Meanwhile, I'm not sure if Tremella fuciformis is a "powerful anti-aging" ingredient but it does have several scientific kinds of research relating the plant to anti-aging and improving skin texture. For further reading please refer to Journal: Scientific Explorations of the Snow Fungus (Tremella furiformis Berk.) in Republican China: A Brief Review. 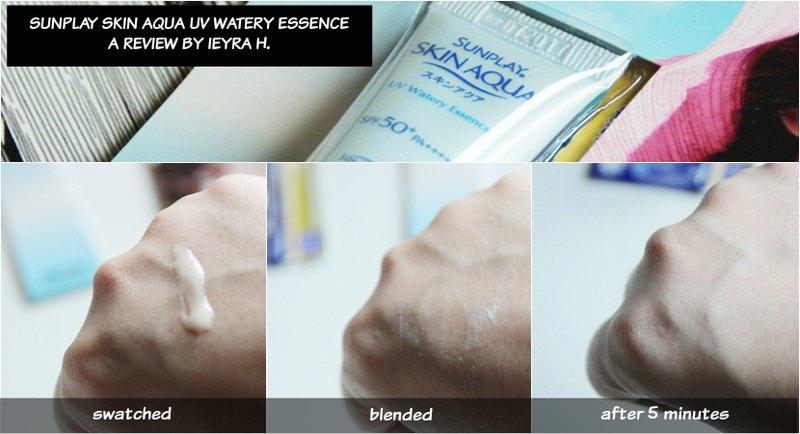 I expected the texture of the Sunplay Skin Aqua UV Watery Essence to be super duper watery due to how it was named, but to my surprise, it's' quite gel-like. I still need to be careful though when squeezing it out because it just comes out a lot due to its thinner consistency. This sunscreen is slightly yellow in colour and it's cosmetically elegant. No white cast detected, but this will leave you with a minimal sheen appearance, at least until it is fully absorbed. Pictures above were taken without flash from a camera. So, this is my overall opinion, and what I think it differs from other sunscreens I've reviewed in this blog. Despite having alcohol as the second ingredient, dare I said this sunscreen is not drying at all. In fact, it reminds me a lot of the Sunkiller Perfect Water Essence due to its moisturising effect, except that this takes forever to dry up (which is weird). So I don't entirely agree with the "absorbing instantly for an invisible, weightless feel" as advertised by Sunplay. Very light since it's a water based BUT it's tacky! if that makes any sense. Still, I think anyone looking for a non-greasy sunscreen would really appreciate this Sunplay Skin Aqua UV Watery Essence. Subtle flowery scent. I quite like it. I'd prefer to use this as a stand-alone product, meaning that just the sunscreen without any makeup afterwards. I personally think this product does not team up with my makeup that well. It moves around (since it doesn't dry up easily) and I'm questioning if the sunscreen is still there when I'm applying my makeup. Also, I totally disagree with the "spread easily over skin" claim because it doesn't. At least my sunscreen over here gets easily ball up(?) not sure if I could explain that...but, meh! I mean I thought I was the only who felt like this, but when I asked my sister to give it a try, she had the similar opinion as mine. 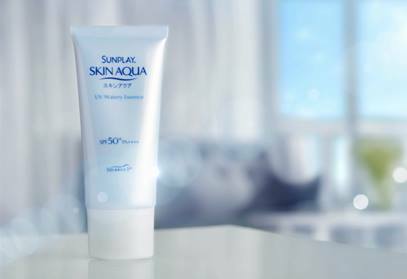 Bottomline- I will not purchase the full size but if you're interested in it, Sunplay Skin Aqua range is available affordably at Guardian, Watsons, SaSa, AEON Wellness and other major department stores for RM40.00/50ml.